I’m still in NYC and after a full day of meetings and another evening show (Chicago – I bought tickets for less than half price from a scalper and felt very NYC-savvy), I’m getting ready for Better TV tomorrow and a few more magazine meetings before flying back home to Bellingham, Washington. This project was designed by Debbie C. of the renowned SoapyLove. Debbie was the first to do Soap Popsicles on a grand scale with difficult designs and fetching colors (don’t miss her ghoulish Halloween designs). Here, she shares her very cool “Silhouette” technique with Soap Queen Readers. If you haven’t seen the Silhouette Soaps, click here to be taken to a post with a picture of a gaggle soaps using this technique. 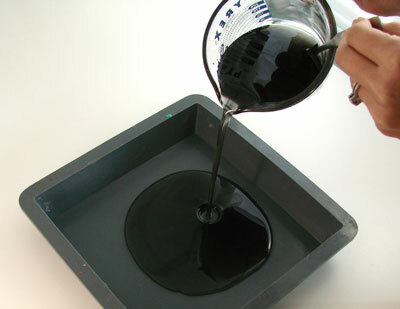 To mix the dispersion colorant, black oxide (why black oxide? It doesn’t bleed. For a primer on bleeding, click here), mix a little rubbing alcohol with the black oxide. How much is “a little bit?” I like to do 70% alcohol to 30% black oxide. Stir this slurry up well. Notice there are still clumps in the bottom. Not to worry, these will stick to your bowl as you pour the black oxide mixture into your soap and you’ll be left with a wonderful dark black. 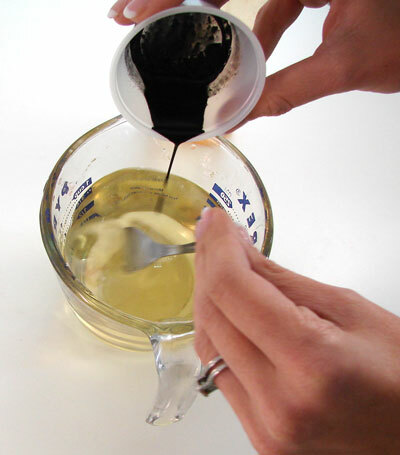 Once you have the black slurry, cut clear soap into small chunks, approximately 1 ounce per bar you’re making.Put into Pyrex cup and melt in microwave – about 15 seconds per ounce.Stir until all chunks are melted. 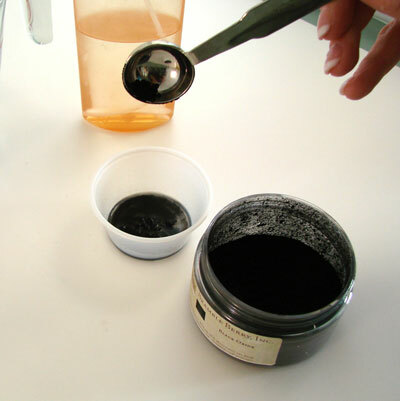 Add pigment to clear soap and stir thoroughly.Add more pigment mixture if needed to get a nice, dark black color. Pour into soap mold, making 1/8” layer. Don’t forget to spray with rubbing alcohol to ensure there are no pesky bubbles marring your flat surface. Allow to set at room temperature; if in a hurry, put in refrigerator for 10 minutes until solid.Save any extra soap to re-melt for future projects. You can also pour into your plain multi-cavity soap molds – that way you are sure your silhouette will fit in your soap mold. 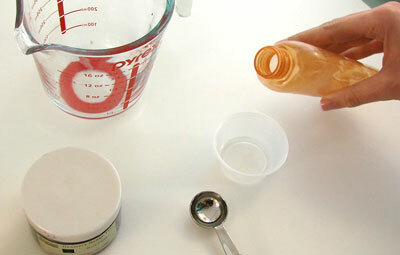 Make your black flat soap and check back tomorrow on how to prepare your sillouette. I don’t think I’ve seen a soap pin – can you give me a little more info? I’d love to help you out! do you know where i could find “soap pin”? not sure if that is the correct term. i was at a friends house and she had a cute little pin in the soap. she got it as a gift. would love to find it.